Why did she have to sit here with this insufferable old woman, Lynette thought. Anything was preferable than playing babysitter. Worse, her mother had taken away her phone, saying Lynette was expected to watch over her great-grandmother Viola that afternoon at her apartment. “You miss testing?” her great-grandma asked. The air was chill, the first hints of fall in the clear cold wind coming off the beach. The sun was just setting, the afterglow lighting the sky with pale blues and pinks. Viola looked up at the sky as she walked up from the beach, toweling her hair and marveling at how the sight never seemed to get old. Maybe that was because each sunset was unique, like a snowflake. Gardeau grabbed her other hand, then pulled her close, his arms squeezing her as his hand covered her mouth, silencing her scream. Viola struggled, kicking and flailing as he began to drag her up near the pier. Viola hit at him, getting in a lucky blow. Gardeau grunted in pain, then hit her hard across the face, stunning her. Gardeau grabbed her arms, dragging her towards the darkness under the pier. As he entered the dark, he suddenly cried out in pain, then slumped. “Viola?” a feminine voice asked tentatively. “Lahlah?” Viola ventured, reaching out to take the pale offered arm. Viola ran for home, casting one look over her shoulder, her last view of Lahlah dragging Gardeau’s body beneath the pier. Viola was alone on the pier, her thoughts troubled as she watched the sunset. Gardeau was dead, so there was no reason for her to be afraid. But she couldn’t shake the feeling of being watched. She turned to go, letting out a gasp to find Lahlah right behind her, her hand extended. “Did you kill him?” Viola blurted, then went white, clapping her hand over her mouth as she shrank back against the railing. “What happened?” Lynette asked, enraptured. Grandma Viola smiled then reached behind the picture, pulling out a coin. She placed it in Lynn’s hand. It was a silver dollar marked 1901. 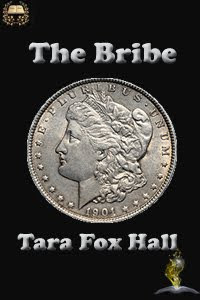 About the Author:Tara Fox Hall’s writing credits include nonfiction, horror, suspense, erotica, and contemporary and historical paranormal romance. Her first full-length novel, Lash, was published in April 2012. She divides her free time unequally between writing novels and short stories, chainsawing firewood, caring for stray animals, sewing cat and dog beds for donation to animal shelters, and target practice. What a superb story! Tara Fox Hall at her best! Tara you never fail to amaze me! How do you manage to be so prolific - and so GOOD! I love what you do inside my head! You are a word-artist and you fill my mind with powerful images that last and last. Well done. I LOVE this story. Thank you for sharing it. Glad you like the story, Manic Scribbler :) Your praise is always a cause for celebration!